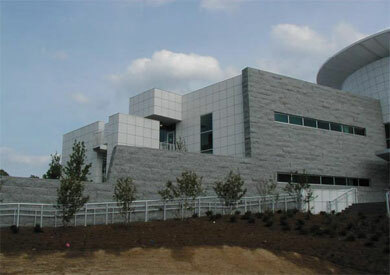 Situated on a lake alongside Interstate 220 in North Jackson, the MDES building is sure to become a well-known landmark. 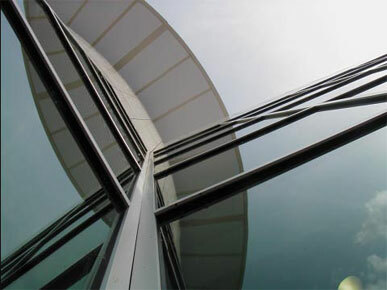 The Mississippi Department of Employment Security’s building, designed by the Jackson architectural firm of Johnson, Bailey, Henderson, and McNeel, replaced the original headquarters on West Capitol Street in downtown Jackson which had served the agency since 1959. 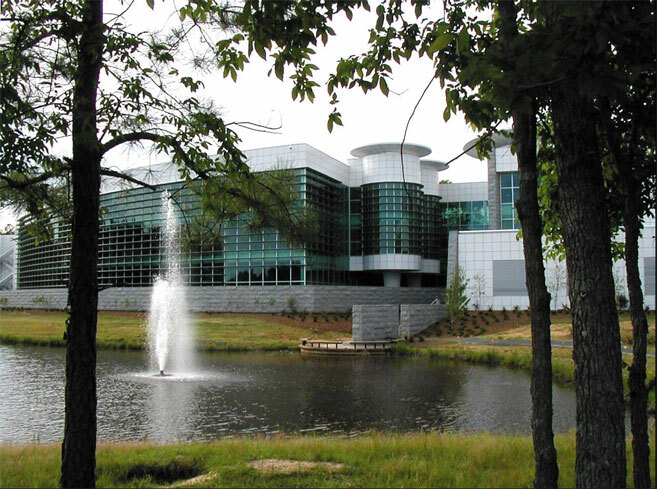 The cost for the land and the building came entirely from federal funds provided to all 50 states by the U.S. Department of Labor in 2002. 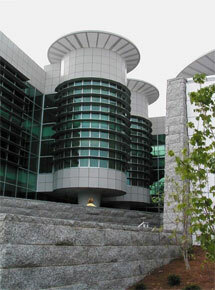 The three-story building contains 113,000 square feet of space, over 24,000 more square feet than the former location, and can accommodate over 350 employees. 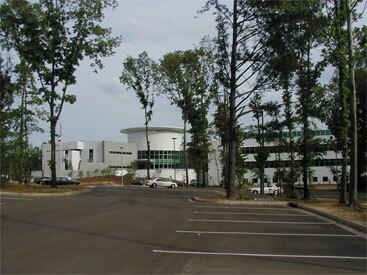 Construction by Roy Anderson Corporation of Gulfport began in May of 2002 and most employees were moved in by November of 2004. 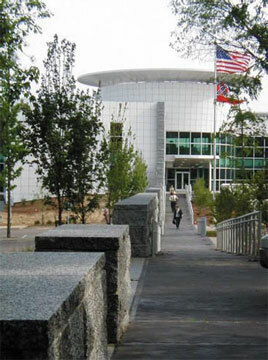 The long wall (left) that separates the public and private areas of the building can be seen in several of the photographs in this pictorial. 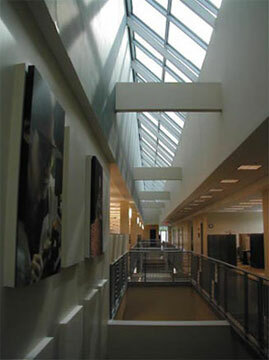 The skylight that runs the length of the building's west wing (center) provides a pleasant illumination to both floors, reaching the lower level through a series of stairwells. 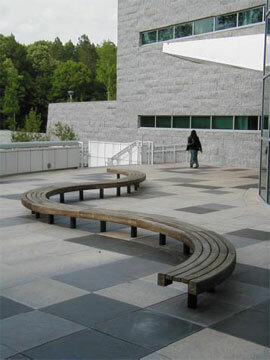 This sinuous bench (right) serves as an eye-catching counterpoint to the building's cicular entrance hall. 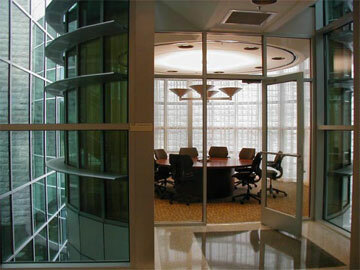 Four conference rooms (left) are located in the two towers (below) — or pods as they're called by the employees — overlook a comfortable break area (right). 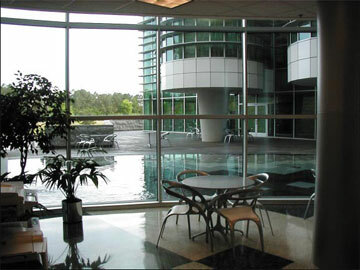 The shallow reflecting pool on the patio has played host to visiting ducks who wander up from the lake (see photo at top of page). 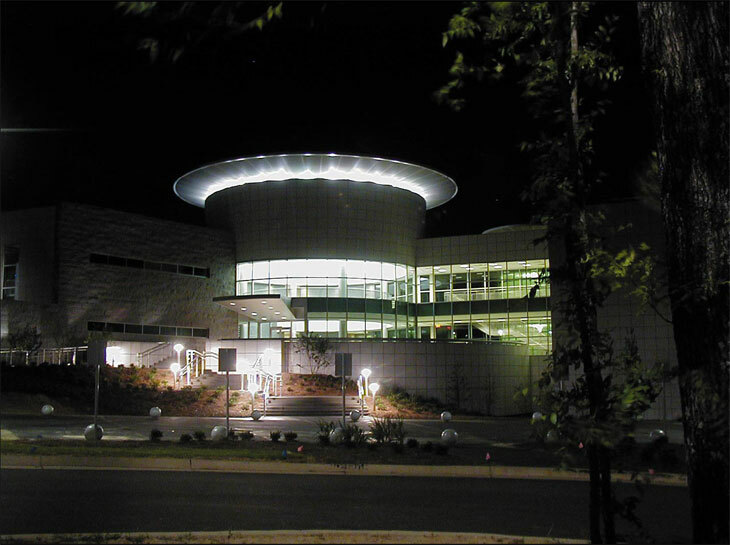 A 600-square foot fitness room, a half-mile walking track, and an employee mail center round out the amenities available to the people who work at the Mississippi Employment Security Commission building. 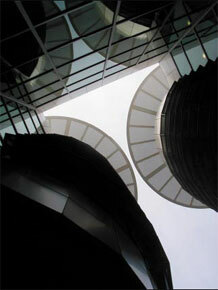 Stylish and appealing in its design, the building was more than three years in planning and construction.